There were many great photos at Creative Sparks last Thursday making it difficult to highlight just one. This week’s featured creative photography idea comes from photographer Nancy Alderman. Nancy recently took a trip to Iceland and brought back some beautiful images and some delicious chocolate to share. How did she know? I really love the sense of light and color in this image. It’s very peaceful and relaxing. 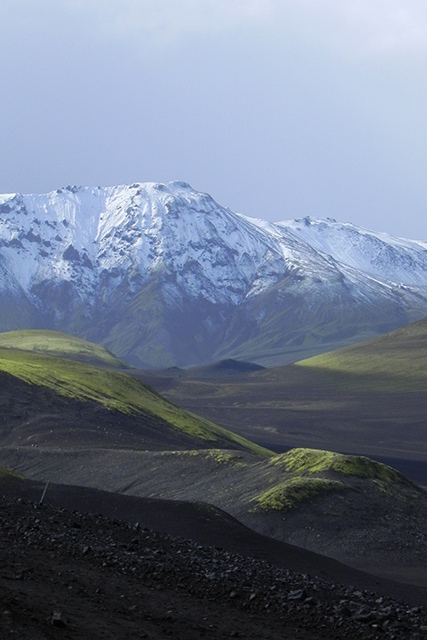 The contrast between the dark lava rocks, green mountains, snow caps and the suggestion of soft clouds is beautiful. The layers of curved horizontal lines make an interesting composition. Photograph © Nancy Alderman. All rights reserved. Used by permission.